What if Superman came down to Earth and, instead of helping the population, decided to enslave it? That’s the question posed by Suicide Squad, director David Ayer’s anti-Avengers, a movie where the bad guys unite under the flag of good, while at the same time consistently reminding us they are bad. It’s a movie that, in principle, sounds intriguing, if for no other reason than we don’t often see movies starring the bad guys. 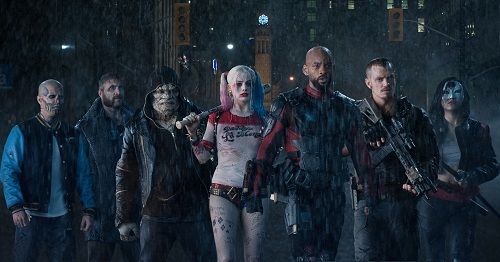 But unfortunately, outside of a few strong performances, Suicide Squad‘s concept is all it really has going for it. The rest of the movie is an awkwardly paced mess that relies too heavily on tired superhero movie tropes. This was supposed to be the anti-superhero movie, but instead, Suicide Squad is the mediocre superhero movie. The story brings together a group of B-list (or, in some cases, C-list) villains from throughout the DC Comics universe. As the film will constantly remind us, these are the worst of the worst, from hyper-accurate assassin Deadshot (Will Smith) to Joker’s right-hand lady Harley Quinn (Margot Robbie), all brought together by Amanda Waller (Viola Davis). Waller is actually the most fascinating character in the film because she understands the risks involved with her proposed task force. She’s the type of character that would sooner level a full city block than let anything tarnish her reputation. Waller’s “suicide squad” is tasked with entering Midway City and eliminating a mounting threat. Of course, the group would much rather cut and run than help, but each villain has their own reasons for staying.that and the threat of death. Narratively, Suicide Squad has enough moving parts to keep it exciting the whole way through. There are bits of humor, action, and even some heart, but it never adds up to anything truly special. It’s also very awkwardly paced – starting with an extremely bloated montage wherein the audience meets most of the main characters. This sequence is just one big info dump that, despite some flashy style, feels like lazy exposition and character set-up. That early montage is emblematic of the film as a whole, which feels like the poster child for studio decision-making. Obviously, it’s unclear what is director David Ayer’s doing and what is the studio’s urging, but there are numerous parts of Suicide Squad that clash with each other. The introduction of the Joker (Jared Leto), for example, appears mostly motivated by a need to get this new universe’s version of the character on-screen as soon as possible. That’s clear because, outside of fleshing out Harley Quinn’s backstory, The Joker actually has no role to play in the film. It also doesn’t help that Leto plays the clown prince of crime almost like a parody of the character – as if a real-life privileged street thug wanted to impersonate the character made famous by Jack Nicholson and Heath Ledger. Even as the film races towards its climactic throwdown (with CG villains that look like they were pulled from a late ’90s action-adventure film), it can’t keep focus. The only thing that most will agree upon is that the lead actors, specifically Smith, Robbie, and Davis, are great in their respective roles. And luckily the film knows it – choosing to focus on those three characters more than most others. Some will even argue that Smith’s Deadshot and Robbie’s Harley Quinn save the film from being generic, B-movie superhero fodder, and they aren’t necessarily wrong. Harley Quinn is unlike anything we’ve seen in a comic book movie thus far, and she brings a dangerously fun air to her scenes. Deadshot, on the other hand, is our redemptive character – a bad guy merely because his skills best suit that type of lifestyle. With a few rewrites, Deadshot could have easily been made the hero of his own movie, and no one would be any the wiser. Despite many of the knocks against Suicide Squad, there’s still a fun center to the film that helps keep it moving. Yes, the pacing in the first half is bogged down by the character introduction montage, and it never really nails down the idea that these characters are bad guys doing good, but the ride is entertaining enough and the core actors are talented enough that you will stay on-board, even if you are apprehensive the whole way through. There’s no doubt tons of room for improvement in the future, but for what it is, Suicide Squad gets by with a passing grade. Comic book movies of all shapes and sizes largely get by on the strength of the characters and their action. Some can make up for deficiencies in one area with a little extra in the other, and that’s the case with Suicide Squad. The action isn’t particularly memorable overall, but there are some fight sequences that are exciting and moments that will have audiences cheering. But overall, it’s not on the level of a showdown between Batman and Superman. There’s no general sense to why these specific characters were necessary to the team, outside of a general ability to kill. Really, if the team had just been made up of Diablo (Jay Hernandez), it likely would have accomplished the job faster. Then again, that’s not the fun of a team-up movie, so we need more diversity. It’s just a shame that the diversity in the characters didn’t extend to the action, which is pretty mediocre overall.